SKU: N/A. Categories: Orthopaedic Breathe Eze Innerspring Mattress, Nursery Furniture, Mattresses. Tags: Babyhood, innerspring mattress. The babyhood Orthopedic Breathe Eze Innerspring Mattress is designed to provide your baby with optimum orthopedic support for their delicate body and great breathability through the cotton cover which zips off for a more hygienic sleeping environment; keeping your baby more comfortable and safer, in a firmer innerspring mattress, that will last for years to come. 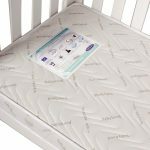 Why are babyhood’s Innerspring Mattress Better? Layer 1 comprises of high quality 100% quilted fabric covers which are breathability and are quilted for your baby’s comfort.Our covers vary from cotton to bamboo cover depending what you prefer for your baby. This outer cover can be removed for washing with the easy to use zip and therefore provide a clean and hygienic sleeping surface so toilet training is now made so much easier. Layer 2 comprises of the thermally bonded fibre pad and wadding which is safer and more supportive.All babyhood padding and wadding is made using heat bonded polyester fibre. Polyester fibre is a great form of padding and provides a firm and elastic sleeping surface for your baby. Did you know that over 12% of the population suffer from asthma and 40% from allergies, the babyhood Breathe EzeTM Mattress Range is a breath of fresh air for your newborn baby. Our breathe eze fibre is made from polyester which is a non-toxic , non harmful and a low VOC product. Polyester fibres are strong and the size of our fibres are large, so they are non respirable and therefore prevent airborne fibre occurrence. This limits any chance of becoming a potential airborne pollutant and are therefore much better for your baby. The breathe eze fibre is not only breathable for your baby but dust mite and allergy resistant and anti microbial also, which is so essential for your precious baby’s growing body. There is no foam in our breathe eze fibre mattresses. We do not use foam in our breathe eze mattresses because we believe it is toxic for your baby as it omits fumes which may impact on your baby’s respiratory system. We also do not use foam as it is highly combustible and often requires the addition of formaldehyde and fire retardants. There are no fire retardants or formaldehyde in our mattresses as our breathe eze fibre is inherently flame retardant and does not flare up like other textiles. We use thermally bonded fibre as this process utilizes less chemicals and reduces your baby’s exposure to harsh chemicals used in other chemical and petroleum methods of bonding. So there are no binders, adhesives or blowing agents which may have significant health impacts over time. Layer 3 comprises of the spring and frame construction.The babyhood Innerspring Range uses high quality bonnell springs which provide exceptional support for your growing baby, for years to come. Bonnell springs are hourglass-shaped and the ends of the wire are knotted or wrapped around the top and bottom circular portion of the coil and tied. All the individual springs are then tied together using spring wire, and the completed structure is reinforced with a strong border wire to retain the shape and form a mat. A round helical crosswise connects each single spring to a spring unit. Different thickness (being the gauge) of wire in the springs makes a harder or softer mattress. For babies the Australian Standard recommends a firmer mattress, so our mattresses have a lower gauge. The number of springs per mattress type is one of the key quality characteristics of a Bonnell spring mattress which makes our babyhood mattresses the best choice for your baby. The specially designed superior quality Bonnell springs, are supported by a tempered steel frame for orthopedic support for your baby’s body through their head, neck, back, spine and intervertebral discs. Very importantly our corners are supported by corner springs which help to prevent entrapment of your baby’s limbs when they stand on the corner of their cot. So your baby is better supported on a babyhood innerspring mattress. We are so confident that you and your bub will enjoy the safety and comfort of a babyhood mattress for longer that we offer a 10 year manufacturer’s warranty on the structure of the springs. It is now easy to make the safest choice for your baby with a babyhood breathe eze mattress. Our mattresses are made from Breathe Eze Fibre. This is not foam. To care for your mattress we recommend that you rotate your mattress regularly (once per week), especially where your child sleeps in the same position. At least once per month we recommend that your mattress is aerated in the sun, on a warm sunny day. Lay the mattress on a flat clean surface and rotate through the day. This helps to ensure your mattress stays aerated and firm. Humid weather and perspiration will cause your mattress to compress more easily. To alleviate this you can wash your mattress with cold water and dry completely in the sun or use a hair dryer to aerate your mattress (warm air). Do not dry clean. Do not put in the washing machine or dryer. Always remember current safe sleep guidelines recommend babies must be placed on their backs when sleeping.